I finished sealing the tanks about a week ago, and the last two days I spent leak testing them. I made a water manometer and pressurized the tank to about 20″ of water. Over the course of 4 hours the tank pressure fluctuated a little, as the temperature rose in the garage the pressure went up slightly. I didn’t bother doing the math to calculate the pressure rise, but it’s safe to say if there was a leak it wouldn’t go up. Just to be safe I also sprayed the whole tank with soapy water to see if bubbles formed. This actually cooled the tank down a bit as the cold water was sprayed on, and the pressure dropped down. This is the setup I did for both tanks. And both are rock solid. A big milestone under my belt and I’m glad it’s over! I performed a similar test for the other tank and let it sit overnight. Again no drop in pressure and no bubbles formed at any point on the tank. 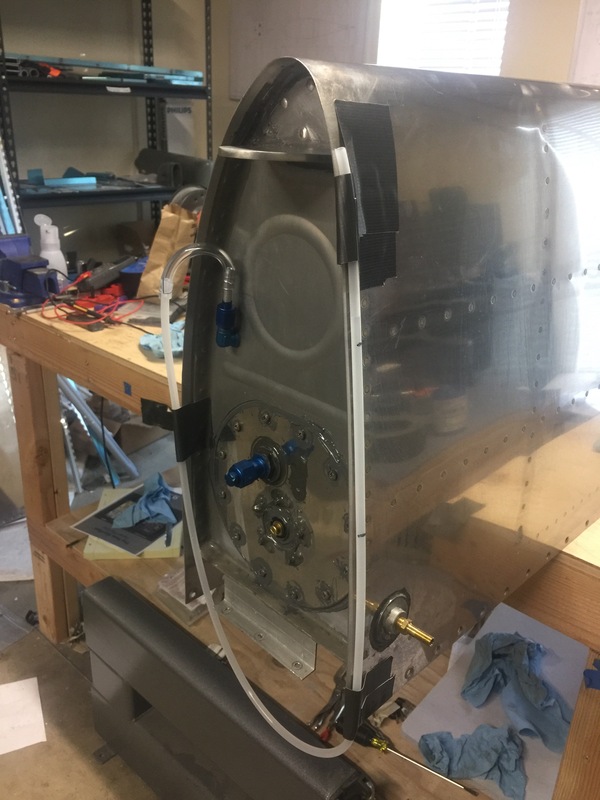 I then spent some time installing the tanks onto the wings, once they are installed there’s only a couple more things to do to mark the wings done. Install right aileron and brackets. 3 and 4 will be pushed off until the very end of the build. There’s no rush in installing the bottom skins as it’s better to have access than to not. 1 and 2 should be a few hours work and then I’m done! Wings will be put into storage and then fuselage time.